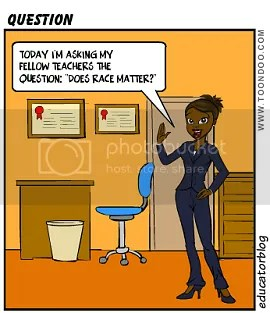 This comic accompanies my post entitled Do Teachers Influence Blackness? The most popular approach (especially in the early grades). Uses the speeches of MLK to argue that we live in a colorblind society. Implies that the Civil Rights Movement of the 1960s was wholly successful and that race is a non-issue. Most likely to assign attendance at a “peace assembly” as an extra credit assignment. Tag line: “Let us not wallow in the valley of despair. I say to you today, my friends, that in spite of the difficulties and frustrations of the moment, I still have a dream. It is a dream deeply rooted in the American dream. I have a dream that one day this nation will rise up and live out the true meaning of its creed: “We hold these truths to be self-evident: that all men are created equal.”” – MLK, Jr. The bright side: This point of view is a large step up from the unfettered bigotry of past decades. It may be an appropriate foundation ideology when talking to young children about race. It reaffirms notions of American meritocracy. The dark side: Colorblind and Laissez Faire racism: In a world devoid of conversation about race and privilege, institutional systems of bias remain entrenched. The colorblind ideology does not hold up in practice – many factors influence how individuals consciously or subconsciously assess race (ex: stereotyping in popular media outlets). The meritocracy might not exist. 2. The touchy-feely introspective empathizer. Closely related to the colorblind champion (but with an empathetic twist). Found in mediation sessions, peer counseling meetings, diversity trainings, and leadership camps. Believes that all prejudice of all kinds can be countered if everyone would just “walk a mile in another’s shoes”. Tries to root out the language of oppression (ex: “My gay friend” becomes “my friend who self-identifies as being gay”). Avoids using terms like “black” and “African American” all together. Most likely to assign a diverse team building exercise for extra credit. The bright side: Awareness and empathy are positive attributes that are necessary for conversations about prejudice and other hot-button issues. People should reflect about the language they use to refer to others. The dark side: Since this point of view is usually crammed into a few hours or a “diversity day”, it is hard for students to unpack the complexity of prejudice and language. Also, there may be too much of a focus on PC language (rather than deep intellectual discussion, creating classrooms that are safe areas for the discussion of tough issues, etc). Usually found on college campuses. Challenges students to “think outside of the box” when it comes to race. Assigns The Bell Curve and other works that promote ideas that are “counter-culture”. Tells students it is okay to be politically incorrect. Tells a narrative about discrimination against and oppression of white and Asian American men at the hands of Affirmative Action, welfare, race/gender-targeted scholarships, and class-action lawsuits. Most likely to assign a defense of The Bell Curve for homework. The bright side: Students hear new points of view about prejudice and can speak freely about the subject. Many white students feel less threatened. It is a rigorous intellectual exercise to compare alternative viewpoints. The dark side: Most students weren’t taught how to have non-PC conversations about prejudice – racist comments ensue. Many of these classrooms don’t exhibit diversity (gender, race, or otherwise). Minority students feel threatened. 4. The social justice league. Most often a (white) liberal member of the university faculty. Rejects race realism, the colorblind framework, and the notion that the Civil Rights Movement was successful. Calls for activism and the total (social/political/economic) restructuring of America. Talks about whiteness/white privilege. Most likely to assign readings from White Like Me. The bright side: Calls upon students to examine the role of race in the social, economic, and political realities of America. Motivates students to take action. Provides alternative histories. The dark side: Can be just as divisive as the “Devil’s Advocate”. Perceived by many to be anti-capitalism and anti-meritocracy. These approaches are from my experiences – How do you handle race in the classroom? What roles do teachers have when it comes diversity promotion (race, gender, sexuality, etc)? I think that there is a reasonable amount of diversity in the edublogosphere (see earlier post). There are teachers whose blogs reflect a diverse range of perspectives – different taught subjects, geographic regions, student populations, issues, etc. I don’t think that I’m the only African-American edublogger but I have noticed that racial diversity is lacking in the ‘sphere. Am I wrong? If not, what are the reasons? What are the implications (for the web community, students, and other stakeholders)? I’m looking for input on the subject.